Do you have a dream? I know in those younger years I was just praying to God that I could get some sleep to have a dream! But, I'm talking about the ones you have while you're awake; the ones where you see yourself being somewhere or doing something? The dreams you only have time to visit when the kids are all in bed and the demands of the day are set aside? The ones that dig deep down inside of you and find the heart of who you are: Your passions. Your love. Your goals. Your heart? Maybe you haven't taken the time lately to dream. Might I encourage you to find your dream. What are you passionate about? What do you delight in? If time and money were no object, what would you do? Where would you go? We should all have dreams. 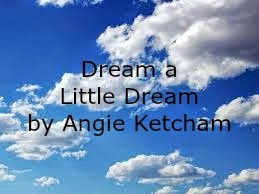 A dream is what inspires us to keep hope alive in our day to day hum drum. There is no dream that is too lofty that God cannot use to get you where He wants you to be. He has planted that dream inside of you for you to accomplish His purpose for you during your time down here on earth. You may not be able to complete that dream today or maybe not even in the next 10 years, but you need that dream alive inside of you. Take a step forward to meeting your goal. Maybe you want to one day be an architect or photographer. Maybe you could check out some books from the library on the subject or sign up for a class at the local junior college or seminar just for fun. You may not be able to go all in, but baby steps toward your goal keep the dream alive. Plant things around your home or in your environment that remind you of the dreams God has placed in you. If you love to decorate and have a dream to aspire to a home decorator some day, put a special vase of flowers in your home to remind you of that dream. When you look at that vase, let the dream come alive once again. When the time is right, God will open the doors to those things He has planted inside of you. When I was in my early 20s, I had a dream to be a writer. I was inspired at a MOPS meeting one day to keep the dream alive, much like I’m telling you about today. I went and checked out books on writing and how to become a published author. I knew that it was my time to become a famous writer. Looking back, I have to smile at the naivety of the thought that it was going to happen overnight. I became overwhelmed with trying to make it all happen while juggling two toddlers and working outside of the home several days a week. I didn’t realize that God puts dreams in us to carry us through this thing called life. Those dreams spur us to carry on even through the hard stuff. We learn lessons about life along the way. And when the time is right, God places the right people in the right place at the right time to accomplish his purpose in us. My children are nearly grown now. I’m looking forward to what life looks like beyond raising babies and I have to say, it seems a little scary. But, I am also reminded of that MOPS meeting early on when God awakened a dream inside of me to write. He has given me a story that wasn’t so easy to live (but great material to write about one day). And providence has brought along opportunity to write these words of encouragement to you, dear momma. Keep dreaming. God has something big for you! Ah I love this for you in this season of your life, and the encouraging reminder it serves to my life as well. Dream, oh the luxury, I once thought... After reading this and letting your dreams spur my desire to dream again I say, dream on to all dream bigger than you ever imagined and dream freely. A dream is one of the few things that can't be stolen or lost or taken because you can always dream a bigger dream. I loved this! Thank you for the jump start once again, friend! Praying all our craziest God placed dreams come to pass!